​Your home is our business. Following a careful inspection of the home we review the findings and educate homeowners with regard to the condition of the home and all of its major components. ​​The inspection report is emailed to both the buyer and their agent within 4 hours of completion of the home inspection. ​​ A 3-ring binder is provided at the time of the inspection should you wish to print a copy of the report. The binder includes a free 92-page home maintenance & repair manual. It's important to keep in mind that a home inspection is a VISUAL inspection of the interior and exterior of a home. 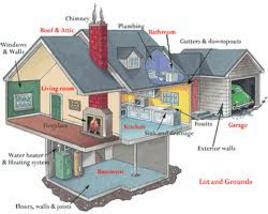 Homes may have defects that are not visible at the time of the inspection. An example of this might be issues with the main drain line leading from the home to the sewer main in front of the home. If issues are suspected the report will include recommendations for further evaluation by specialty contractors, such as a licensed plumber. We are a "green" company and prefer paperless distribution. However, the client may print the report and store it in the 3-ring binder provided. Certified by ITA, a California-based inspection training and certification company. Member of InterNachi.